As 2013 began, people started looking for ways to be more positive about their lives. There's been the concept of a "joy jar," where you put little pieces of paper with good things that have happened to you, even in the smallest of ways. There's even a virtual version on Facebook. It's so nice to read about the simple things in life that make people happy on a daily basis. 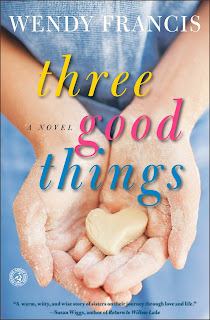 Our guest today, Wendy Francis, captures that concept in her debut novel, Three Good Things. It's about two sisters who aren't completely satisfied with their lives and long for the advice from their mother, who passed away years ago. Her motto was: "At the end of every day, you can always think of three good things that happened." Wendy Francis is a former senior editor in book publishing. Her writing has appeared on The Huffington Post. (Great article about When Harry Met Sally. A must read!) She's also been featured in local magazines, such as The Improper Bostonian. Wendy is currently a freelance editor and writer living with her family (including a four year-old son; she and I should definitely talk...) outside of Boston. 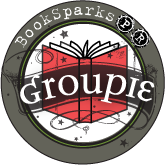 She's here today to answer some fun questions...which are in groups of three! It's the last day of animal month and I think you'll enjoy what she had to say on the topic! 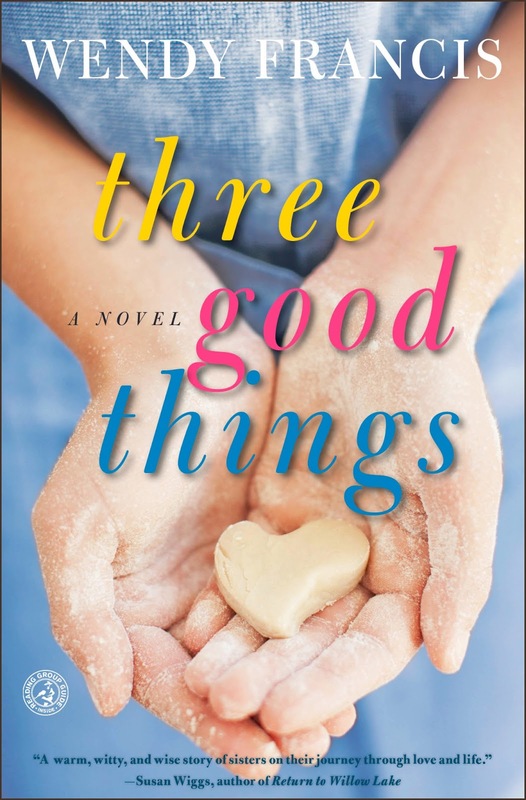 Additionally, Simon and Schuster has FIVE copies of Three Good Things to share with some lucky readers in the US and/or Canada! Visit Wendy at her website and on Twitter. • Hazelnut coffee with a dash of cream. As my family knows all too well, nothing gets done around here until I’ve had my early morning infusion of caffeine. • Multiple Pilot Precise V7 Rolling Ball pens. Have you tried them? It’s easily the best pen in the world. I like to review what I’ve written the day before and edit on the page with these pens. It probably makes me old-school, but old habits die hard. • A picture of my four-year-old grinning. Whether it’s on my laptop, my phone, or a framed picture on my desk, his impish grin spurs me on. On really tough writing days, I have a bag of red Twizzlers at the ready. Oh, there are so many! I guess if I had to narrow it down to three, it would be Elizabeth Strout, Elin Hilderbrand, and Lee Woodruff. • I love Elizabeth Strout’s characters and her finesse for bringing a place to life, as if the book’s setting is a character unto itself. She’s a master at crafting both beautiful stories and gorgeous prose. • Elin Hilderbrand’s affection for Nantucket, one of my favorite places on earth, wins me over anew with each book she writes as does her ability to conjure up wholly new and wonderful characters and storylines time and again. • Lee Woodruff was an author I first discovered in her memoir, In an Instant, where she tells the harrowing story of her journalist husband Bob Woodruff’s recovery from a traumatic brain injury. I’ve since read her other books, including her recent novel, Those We Love Most, and I’ve come to admire her work even more. 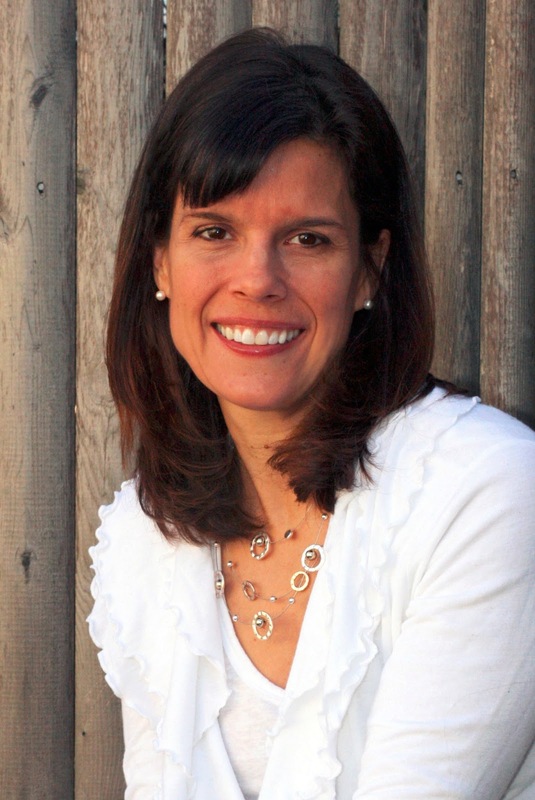 • If I could have a “baker’s three,” I’d have to add Claire Cook to the list, whose sense of humor and nod to “late” bloomers in fiction inspire me every day. • Be patient. You won’t write your first novel or your best novel in the span of a few weeks. It takes time, and often setting your pages aside for a few days or weeks can give you some fresh perspective when you go back. Writing is a labor of love; it needs a lot of nurturing. • Be honest with yourself about what’s working -- and what isn’t. Sometimes it’s hard to let things go that aren’t working. I’d written a few chapters that were getting in the way of the overall narrative for Three Good Things, and they ended up on the cutting room floor. But it was for the best. The book was stronger for having lost them! • When you tell a story. . .“Have a point. It makes it so much more interesting for the (reader).” As Steve Martin famously says in Planes, Trains, & Automobiles, it helps to keep the plot/purpose/point of your story in mind as you’re writing. You can have dynamite characters and crystalline prose, but it doesn’t add up to a novel until you have a real narrative thread. • Snuffleupagus. Is there any animal better than Snuffy? He’s everyone’s hero because he persevered for so many years despite the fact that no one believed in him. • Snoopy. So he’s a cartoon character, but he’s one of my favorites of all time. When he gives Lucy a big, sloppy kiss and she runs around screaming, “Help! Help! I need disinfectant!” I find him especially irresistible. • Eeyore. Who doesn’t feel a little sorry for and enamored of Eeyore? He’s so gloomy, he makes everyone else’s life look like roses. • Brinkley in You’ve Got Mail: To quote directly from the movie: “Brinkley is my dog. . .[He’s] a great catcher who was offered a tryout on the Mets. But he chose to stay with me so he could spend 18 hours a day. . . sleeping on a large pillow the size of an inner tube.” I think that pretty much secures Brinkley’s place in movie lore. • The penguins in March of the Penguins. The penguins in this movie deserved Academy Awards as far as I’m concerned. The cold, the hardship, windswept Antarctica! How on earth did they survive it all? I live in awe of those birds. • Marley in Marley & Me. If you’re sensing a theme here, you’re right. I’m a dog person, and I think every dog person fell in love with that rascal Marley and his antics. Just so long as we weren’t the ones taking care of him. . .
• The gorilla. I like the gorilla’s expressions and the way he watches you through the glass, as if he’s about to reach out and grab you. You know those gorillas are thinking wise thoughts and if only they could talk, they’d have some good stories to share. • The lion. I like the lion because of his regal bearing but also because he seems to nap a lot. I’m slightly jealous that he gets to be king and still get all that sleep. • The giraffe. He strikes me as a rather elegant, somewhat smug animal who figured out long before everyone else that if he grew a long neck he’d have access to all those leaves up there on the tree. Thanks to Wendy for spreading her good cheer and to Simon and Schuster for sharing Three Good Things with our readers. 1. Please tell us: Who are your three favorite animals from a movie or TV show (or a combination of both, such as two from a movie and one from TV)? US/Canada only. 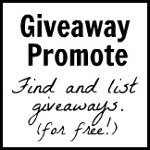 Giveaway ends February 6th at midnight EST. My 3 favorite animals from a book or show are: Lassie, Benji and Bear (from BJ McCabe and his best friend, Bear). I know. I'm aging myself. I'm not following CLC on pinterest too!!! I'd love to win a copy! I follow u on fb and pinterest. First, I must say, Wendy had me at Elin Hilderbrand! I love her books for exactly the same reasons. Second, she had me at her thoughtful expanations of why she loves the specific animals... I cannot imagine how beautifully her book will be written... a MUST read. So, I am surprized I could come up with animals so quickly! Sense a theme??? So,my dog is a Wheaten terrier ad he is smart, faithful and loyal!! OF COURSE I follow this wonderful blog and am also a facebook friend and even twitter (which I just dont get). I really enjoyed Wendy's anwswers so much. It was a nice way to start the day. What a wonderful concept for a book. I am a very positive person always trying to see the good in everything. My hubby calls me overly optimistic to his realistic views! 1. Brutus - sheep dog from Donna Kauffman's Sweet Stuff. This dog made me laugh out loud. 2. Tiger - dog on the Brady Bunch. He always seemed like the perfect dog. 3. Garfield the cat - I love his attitude! And his love for lasagna! 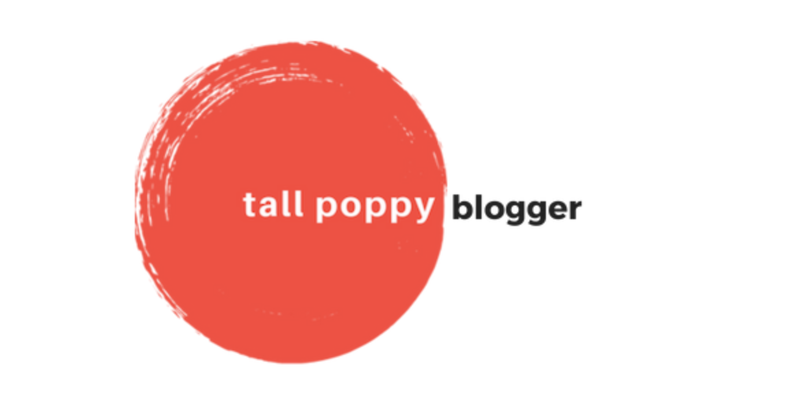 I signed up for this blog. I signed up at Facebook. My three favorite are all in one movie the Incredible Journey. They are different personalities but thewy end up working together. My kids love that one too. My 3 favorite animals are Dory from Finding Nemo and Timon and Pumba from the Lion King. Hakuna Matata! I love when authors give their recommendations about other authors/books! 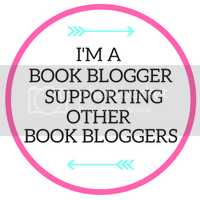 It's a great way to find out about ones that would otherwise be off my radar. My 3 animals - Dumbo (such a sweet baby), Dumbo's mama (such a good mom! ), and Little Roo (from Pooh's Corner). 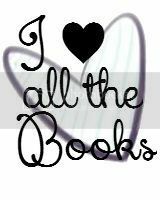 I follow the blog, facebook, twitter, and pinterest. Does Alf count as an animal, if so I loved that furry crazy alien dog thing! I also loved Old Yeller, not how it ended, but the story! And I loved Flipper. I still want to swim with dolphins before I die. It is number one on my bucket list actually! I love the concept of your book. My favorite animal/characters are Kermit, Tigger, and Pooh. 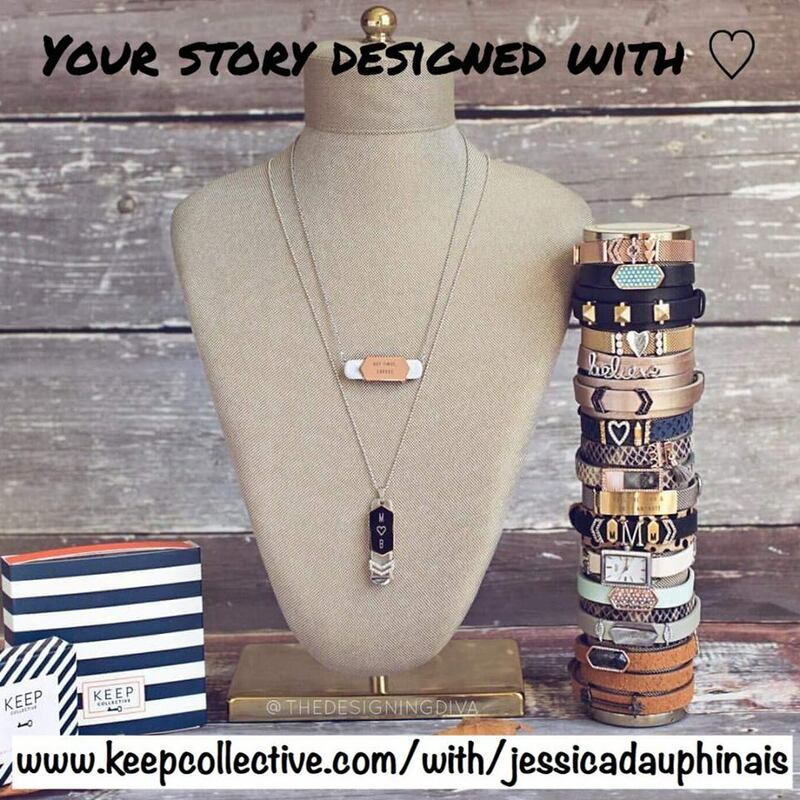 I'm a CLC member, follow the blog, on Facebook and Pinterest. I follow on twitter and my google reader! When I was a kid I loved Lassie and some other favorites are Eddie from Frasier and Babe the pig. 3 favourite animals: Garfield, Odie and Tigger. 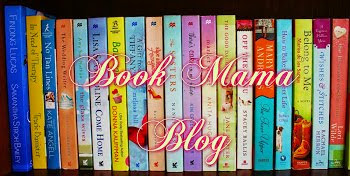 I follow this blog as Jennifer L.
Three animals for me would be....Willy (free Willy), Tamom (Lion King), and Flipper. 3. All the dogs from the movie "Eight Below." I have to go with Sassy, Chance and Shadow from Homeward Bound... ahhh, that movie makes me tear up just thinking about it!